Inspiring and motivating students from the moment it published, Organic Chemistry has established itself in just one edition as the students' choice of organic chemistry text. 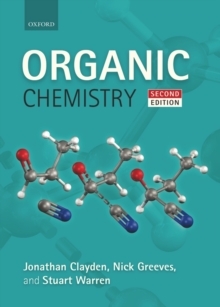 This second edition takes all that has made Organic Chemistry the book of choice, and has refined and refocused it to produce a text that is even more student-friendly, more coherent and more logical in its presentation than before. At heart, the second edition remains true to the first, being built on three principles:An explanatory approach, through which the reader is motivated to understand the subject and not just learn the facts;A mechanistic approach, giving the reader the power to understand compounds and reactions never previously encountered;An evidence-based approach, setting out clearly how and why reactions happen as they do, giving extra depth to the reader's understanding. The authors write clearly and directly, sharing with the reader their own fascination with the subject, and leading them carefully from topic to topic. Their honest and open narrative flags pitfalls and misconceptions, guiding the reader towards a complete picture of organic chemistry and its universal themes and principles. Enriched with an extensive bank of online resources to help the reader visualise the structure of organic compounds and their reaction mechanisms, this second edition reaffirms the position of Organic Chemistry as the essential course companion for all organic chemistry students.